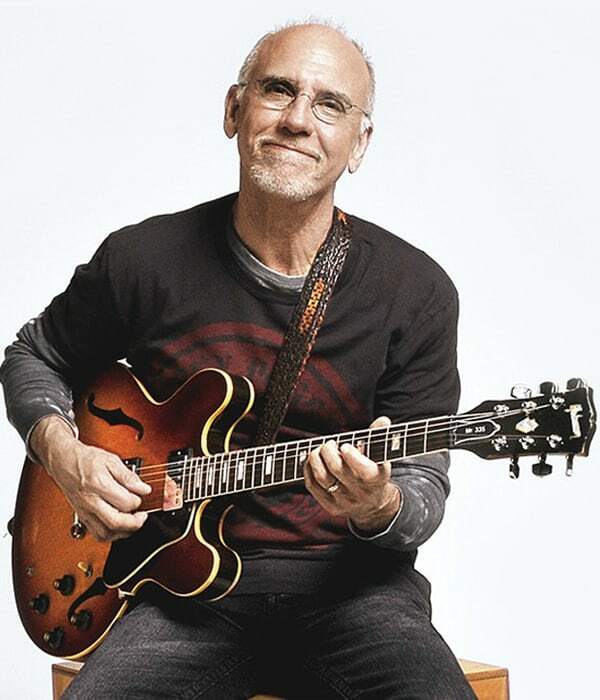 Larry Carltons own musical story began in Southern California. He picked up his first guitar when he was only six years old. He was introduced to jazz in junior high school after hearing The Gerald Wilson Big Band album, Moment of Truth, with guitarist Joe Pass. Larry then became interested in Barney Kessel, Wes Montgornery and the legendary blues guitarist B.B. King. Saxophonist John Coltrane was also a major influence on Carlton, beginning with Coltranes 1962 classic Ballads. In 1968 he recorded his first LP, With A Little Help From My Friends (Uni). The enthusiastic industry response garnered him a place among jingle singers The Going Thing, recording on camera and radio commercials for Ford. Mid-season in his second year, he segued to Musical Director for Mrs. Alphabet, an Emmy-nominated childrens show on the same network. It was here that Carlton showcased his acting skills, performing as the shows co-star, "Larry Guitar." Calls began to increase significantly as Carlton gained distinction for the unmistakable and often imitated "sweet" sound he delivered with his Gibson ES-335. He also broke new ground with his new trademark volume pedal technique, eloquently displayed in his featured performance on ­Crusader One with legendary jazz/rock group The Crusaders in 1971. Joni Mitchells Court and Spark album, the first record she made with a rhythm section, displays his distinctive Technique  a style Mitchell referred to as "fly fishing." During his tenure with The Crusaders (through 1976), Carlton performed on 13 of their albums, often contributing material. In 1973, Carlton released his second solo project, SinginglPlaying, on Blue Thumb Records ­ aptly titled, as he not only played guitar, but also performed vocals on eight tracks. Carltons demand as a session player was now at its zenith, he was constantly featured with stars from every imaginable genre, ranging from Sammy Davis, Jr., and Herb Alpert to Quincy Jones, Paul Anka, Michael Jackson, John Lennon, Jerry Garcia and Dolly Parton. At the same time, he was still performing more than 50 dates a year with The Crusaders. Before he transitioned completely to a solo career, Carlton became one of the most in-demand studio musicians of the past three decades. Carltons catalog of work includes film soundtracks, television themes and work on more than 100 gold albums. Ultimately, Carlton began scaling back his session work substantially, while continuing to perform and record with the Crusaders. He shifted his emphasis to the challenges of arranging and producing, and built his own studio-Room 335-in his home. During this period he arranged and produced projects for Barbra Streisand, Joan Baez and Larry Gatlin, as well as producing and co-writing the theme for the hit sitcom Whos The Boss and co-writing (with Michel Columbier) and arranging the acclaimed movie soundtrack for Against All Odds. As his association with the Crusaders began to draw to a close, Carlton signed with Warner Bros. Records in 1977. Between 78 and 84, Larry recorded six solo albums for Warner Bros. Records: Mr. 335: Live In Japan, Friends; Eight Times Up; Sleep Walk; Strikes Twice; Larry Carlton. The latter self-titled album was released hot on the heels of his debut session with rock supergroup Steely Dan. Rolling Stone magazine lists Carltons tasty ascent on Steely Dans Kid Charlemagne as one of the three best guitar licks in rock music. With more than 3000 studio sessions under his belt by the early 1980s, Carlton had picked up four Grammy nominations. In addition to winning a Grammy (`81) for the theme to "Hill Street Blues" (a collaboration with Mike Post), he also was voted NARASs "Most Valuable Player" for three consecutive years. NARAS then named him "Player Emeritus" and retired him from eligibility. In 1985 he was approached by the newly formed MCA Master Series to consider doing an acoustic jazz album. His first release for the new label was Alone, But Never Alone, a consensus No. 1 album on the Radio & Records and Billboard Jazz charts. The twelve months of 1987 brought some of the biggest highlights in Carltons solo career. In addition to winning the Grammy for "Minute by Minute," Carlton received a Grammy nomination for "Best Jazz Fusion Performance" for his live album Last Nite. Coming off of the success of two acoustic albums and one live album, Carlton was on a hot streak and entered the studio to work on his next project, On Solid Ground. The all-electric project was nominated for a Grammy in 1989. The release of On Solid Ground came almost one year after Carlton was brutally shot in a random act of violence outside his Los Angeles studio. In 1990, MCA acquired GRP Records and placed their jazz artists under the GRP moniker. Immediately, GRP issued a greatest hits package of Carltons work on MCA, called Collection. In 1991, Carlton entered the studio to record a blues-based album with John Ferraro, keyboard man Matt Rollings, bassist Michael Rhodes and harmonica player Terry McMillan. Interrupted by label and consumer demands for another jazz offering, Carlton temporarily shelved what would become Renegade Gentlemen and recorded and released Kid Gloves in 92. A pop-oriented Jazz collection of lilting acoustic ballads and biting electric workouts, the album marked the first time Carlton had included both acoustic and electric tracks on a single solo project. In between touring, Carlton resumed work on the bluesy Renegade Gentlemen. Taking the original six tracks to Nashville (his first time to record in that city), and joining up once again with Michael Rhodes and Terry McMillan, plus drummer Chris Layton (from Stevie Vaughans band Double Trouble) and keyboard wizard Chuck Leavell, he recorded four tracks, plus did additional production and mixing on the blues rocker in time for a 93 release. Carlton toured extensively that year and the next with jazz superband Stanley Clark And Friends (Stanley Clark, Larry Carlton, Billy Cobham, Deron Johnson and Najee). The quintet released Stanley Clark and Friends Live A t The Greek in 94. Larry & Lee, Carltons 1995 collaboration with guitar great Lee Ritenour, garnered him his eighth Grammy nomination. This was followed by The Gift in 96 and Larry Carlton Collection Volume 2 in 97. That same year, his virtuosity and reputation secured him a place in the crum­topping award-winning Warner Bros. Records group Fourplay, when member Lee Ritenour left to head his own label. Carlton doubled the fun by signing to Wamer Jazz as a solo artist at the same time. Since then he has released two albums with Fourplay: 4 in 98 and a refreshingly different Christmas album, Snowbound, in October 99. 1999 also brought Larry Carlton his very own spot on Hollywoods prestigious Rockwalk. On June 3, he was inducted along with Joe Satriani, Steve Vai and Jimmie Vaughn. Larry was born on 2nd of march in 1948 in Torance/California! He moved from LA to Franklin/Tennessee a few years ago and enjoys living in the countryside. Carltons studio credits from the 1970s and early 80s include musicians and groups like Steely Dan, Joni Mitchell, Michael Jackson, Sammy Davis Jr., Herb Alpert, Quincy Jones, Bobby Bland, Dolly Parton, Linda Ronstadt and literally dozens of others. Among his more notable projects as a session guitarist were Joni Mitchells critically acclaimed Court and Spark album and Donald Fagens Nightfly album. For much of the 1970s, Carlton was active as a session guitarist, recording on up to 500 albums a year. Although he recorded a number of LPs under his own name as early as 1968s With a Little Help from My Friends (Uni), and 1973s Singing/Playing, he didnt land a major-label contract until 1978, when he signed with Warner Bros.
Carlton began taking guitar lessons when he was six. His first professional gig was at a supper club in 1962. After hearing Joe Pass on the radio, he was inspired to play jazz and blues. Wes Montgomery and Barney Kessel became important influences soon after he discovered the jazz guitar stylings of Pass. B.B. King and other blues guitarists had an impact on Carltons style as well. He honed his guitar-playing skills in the clubs and studios of greater Los Angeles. He attended a local junior college and Long Beach State College for a year until the Vietnam War ended. Carlton toured with the Fifth Dimension in 1968 and began doing studio sessions in 1970. His early session work included studio dates with pop musicians like Vicki Carr, Andy Williams and the Partridge Family. In 1971, he was asked to join the Crusaders shortly after theyd decided to drop the word "Jazz from their name, and he remained with the group until 1976. In between tours with the Crusaders, he also did studio session work for hundreds of recordings in every genre. But it was while he with the Crusaders that he developed the highly rhythmic, often bluesy style he has now. His credits include performing on more than 100 gold albums. His theme music credits for TV and films include Against All Odds, Whos the Boss, and the theme for Hill Street Blues. The latter won a Grammy award in 1981 for Best Pop Instrumental Performance. Carlton delivered his self-titled debut for Warner Bros. in 1978, shortly after he was recognized for his ground-breaking guitar playing on Steely Dans Royal Scam album. (Carlton contributed the memorable guitar solo on "Kid Charlemagne.) He released four more albums for Warner Bros., Strikes Twice (1980), Sleepwalk (1981), Eight Times Up (1982), and the Grammy-nominated Friends (1983), before being dropped from the label. He continued studio session work and touring in between, emerging again in 1986 on MCA Records with an all-acoustic album, Discovery, which contained an instrumental remake of Michael McDonalds hit, "Minute by Minute." The single won a Grammy Award for Best Pop Instrumental Performance in 1987. Carltons live album, Last Nite, released in 1987, got him a Grammy nomination for Best Jazz Instrumental Performance. Carltons most recent albums include two releases in 1996 for GRP Recordslarry6.jpg, Gift and With a Little Help from My Friends. His other recordings include 1990s Collection and 1992s Kid Gloves for the same label, Playing/Singing (1995, Edsel), and Renegade Gentleman, a 1993 release for GRP.